Our high pressure, high temperature steam cleaning proves very effective when removing paint from all types of surfaces. Unlike traditional pressure jetting, our high pressured steam cleaning will soften the paint before removing it with minimal amounts of water. This also significantly reduces the risk of causing excess damage. AquaBlast’s paint removal system uses a high pressure, high temperature steam cleaning method for best results and minimal amounts of water. Our industrial strength pressure washers mean we can remove paint effectively from all types of surfaces with minimal risk of damage, as it softens the paint before removing it. 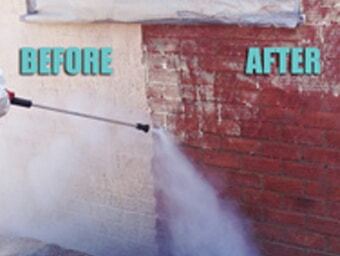 This wet blasting treatment will restore your surface back to its natural appearance, leaving it looking great or ready to repaint.Paint can be easily removed from most walls, brickwork and floors.